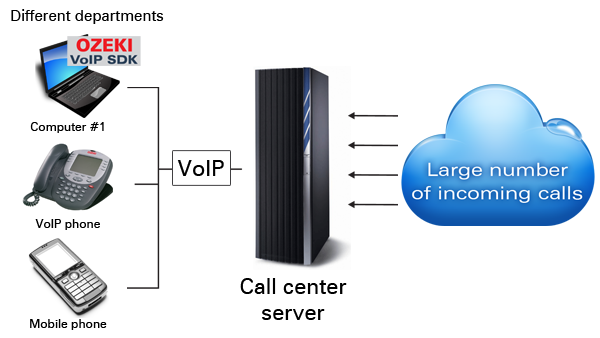 By reading this article you get information on how you can start with call center server applications in relation with Ozeki VoIP SIP SDK. After some introduction of terms, you can switch to the guide that explains how to build a call center server efficiently with Ozeki SIP SDK. A call center is a centralized office that is operated by a company to administer incoming product support or information inquiries from customers. Implementing a call center is an ideal option for both smaller and bigger companies. This way, your company will convey an impressive corporate image through your business call center. With Ozeki VoIP SIP SDK you will be able to create an advantageous call center solution according to all your ideas and your technical needs. This way wide varieties of call center functions can be achieved easily. In order to operate the call center seamlessly, the server side and the client side of the call center must be co-operated efficiently. Call center representatives will only see the client side. It is basically the operator surface through which they will answer the calls. So, every single representative will belong to one call center client. A call center server's task is to redirect your calling customers to the department that is best equipped to satisfy their needs. Such server is almost like a receptionist who transfers calls to the proper lines inside an institution. Some call center servers (Figure 1) are able to do this routing automatically, based on various combinations defined using callers profiles or other information. Besides this call processing following predefined rules, a call center server can register and analyze the incoming and outgoing calls using the information for various purposes. At first, call center calls will run into this call center server. The server will forward the calls to the call center clients. This transfer can be an attended call transfer or a blind call transfer. Attended call transfer refers to forwarding the given call to a predefined destiny. Blind transfer on the other side means that the server selects a client to forward the call to according to an algorithm that was built in the system. The name of the transfer algorithm is 'call routing'. Call routing is a set of rules that defines the method according to which the server chooses the client to answer the actual call. If you have read through this page carefully, you already have all the knowledge you need to start on your own solution.